For the third year in a row, the famous Lewa Borana Wildlife Conservancy in Northern Kenya is inviting guests to actively participate in their invaluable wildlife conservation efforts. You can be part of the ranger team helping to track, locate and count game species for the annual Big 5 wildlife census. This is the most important conservation tool in measuring the success of their unending projects. In addition to joining several other important conservation activities during the safari, you will also have plenty of time for game viewing and other activities. This adventure is a once in a lifetime opportunity to witness and take part in the action behind the scenes to truly make a difference while on safari. The dates for this unique experience are March 2 -14, 2019. Welcome to Kenya! On arrival at the Jomo Kenyatta International Airport, you will be greeted by your driver and local representative to be transferred to the exclusive Emakoko Lodge, which sits on the edge of the Nairobi National Park. The lodge is located only a short 45-minute drive from either of Nairobi’s airports. The ride through the park itself, with its beautiful scenery and abundance of plains game, is a spectacular way to start any East African safari! The Nairobi National Park, despite its close proximity to the capital city of Kenya, features wide open grass plains and scattered acacia bush. Bordering a backdrop of city skyscrapers, this view is an extraordinarily unique sight. The vast and barren landscape is home to a spectacular assortment of birds and wildlife, where over 400 species of birds can be recorded in just one day. With an excellent possibility of spotting at least four of the Big Five here, many Nairobi residents find this rural escape, the perfect antidote to the nearby hustle and bustle of city life. Follow your expert guide into the stunning landscapes of the Nairobi National Park stopping by The Giraffe Center. Here, you will learn about the endangered Rothschild giraffe and see how major conservation efforts are being made to protect this graceful animal. Lunch will be served in the exclusive neighborhood of Karen Blixen, where the famous writer lived, during the colonial times. This is an amazing opportunity to learn about the history, culture, and traditions of Kenya's diverse people. The final stop will be at The Sheldrick Wildlife Trust, where you will have the chance to see first hand this haven for elephants and rhinos that you helped sponsor. After a hearty breakfast, you will be driven from the Emakoko Lodge to the Wilson Airport in Nairobi. From there, you will board a domestic charter flight to the Lewa Wilderness Lodge, where your African adventure continues. The picturesque setting of this property is tucked into the hillside, overlooking Lewa's Eastern Marania Valley. Check into the lodge and begin to immerse in the tranquil atmosphere, before heading off on one of the many extraordinary experiences you will enjoy throughout the next couple of days. The Lewa Wildlife Conservancy is located in northern Kenya. Formed in 1995, it was at Lewa that the conservancy idea was pioneered and it remains a leader in all of the elements – serious wildlife protection integrated to community engagement – that have come to define the private conservancies. Apart from anything else, Lewa ranks among the premier wildlife-watching territories anywhere in Kenya. And unlike in Kenya's national parks where off-road driving is prohibited, Lewa's guides delight in taking visitors to almost within touching distance of rhinos, elephants and other species. Over the next two days, you will have the unique chance to catch a glimpse of the vast spectrum of conservancy found in the Lewa Wildlife Conservancy. Lewa Conservancy offers a firsthand experience of groundbreaking wildlife conservation work. Your activities and excursions will include a visit to the Elephant Underpass, a meeting with the local village chief to discuss how the local population is living with wildlife, a tour of the radio operations room, as well as a meeting with the Tracker Dogs. You will have exclusive access to the Lewa Game Count and an evening lecture by David Kimiti, Lewa Conservancy Head of Development. With so many meaningful experiences at your fingertips, your time here is sure to be unforgettable. After check out, you will walk across Lewa and to Il Ngwesi Conservancy with the help of your expert guide and armed rangers. This walk is an incredible four-hour walk will allow you to experience the full landscape and wildlife that calls Lewa home. Upon arrival at Il Ngwesi, you will have the chance to meet the community that your guide is from and visit ongoing projects from the conservancy, as well as meet local pastoralists and visit a local school. This evening you will attend a lecture from an Il Ngwesi Community Elder. Spend the morning at Il Ngwesi Eco-Lodge visiting the community and projects. This afternoon, you will be whisked away by transfer vehicle to the neighboring Borana Wildlife Conservancy. Upon arrival, you will check into the lodge and start exploring your new surroundings. Get ready for a fun-filled couple of days, getting hands-on experience in the world of conservation. Over the course of the next two days, embrace the once in a lifetime opportunity of partaking in the annual Lewa/Borana Games Census! This vital information is key to the wildlife animal conservancy in the area and you are invited to be an active and significant part of the team. Join Borana's chief conservation officer on his ranger deployments, where you will gather intelligence reports together. Your additional exciting adventures here, will include attending a lecture by Micheal Dyer (MD of Borana Conservancy), monitoring and tracking rhino and lion using telemetry receivers, joining the scouts on foot to track and ID rhino using ear notch diagrams, tracking lions with whisker spot ID methods, mountain biking along boundary fence lines to check voltage and damaged areas, as well as visit the PermaCulture Farm and well-hung butchery with Jack and Llewellyn Dyer. This morning you will be picked up from the Borana Lodge and transferred to the Borana Airstrip in good time to board your charter flight to Masai Mara. Upon arrival at the Masai Mara Airstrip, you will be picked up and transferred to Saruni Mara Lodge. The Maasai Mara is one of the best-known reserves in the whole of Africa, and is globally renowned for its exceptional wildlife. Despite comprising only 0.01% of Africa’s total landmass, more than 40% of Africa’s larger mammals can be found here. The Maasai Mara lies in the Great Rift Valley. 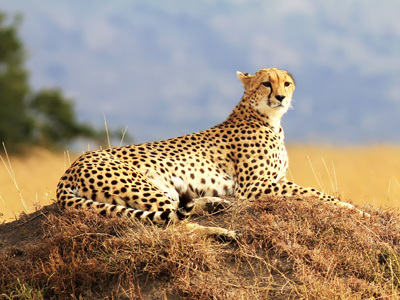 The large plains and open grasslands are habitat to rich and varied wildlife such as lion, leopard, cheetah, buffalo, zebra, giraffe, crocodile etc. There are also several species of birds such as vultures, herons, shrikes, etc. The animals are at liberty to move outside the park into huge areas known as 'dispersal areas'. There can be as much wildlife roaming outside the park as inside. Many Maasai villages are located in the 'dispersal areas' and they have, over centuries, developed a special relationship with the wildlife. The annual migration of millions of wildebeest and antelope, from July to September, is a spectacle never to be missed by any visitor to the Mara. world’. Masai Mara provides some of the best game viewings in all of Africa. While at camp you will be able to partake in the camp activities. During your stay, you will of the opportunity to visit the Mara Elephant Project (MEP). MEP works hard to save and protect the African elephant population in the Mara by combatting poaching operations, collaring, monitoring and researching elephants, and protecting farmers and elephants across their large dispersal area., a conservation project that is working to protect elephants using exciting and modern methods including drones, helicopters and collaring. You will embark on a tour of their Head Quarters, allowing for an in-depth understanding of the work that they are doing. Sadly, your journey through the wonders of Kenya must come to an end today; however, you will be leaving with unforgettable memories, new friends and the experience of a lifetime together! After checking out of the Saruni Mara Lodge, you will be driven to the airstrip in good time to board your domestic charter flight back to Nairobi. The Emakoko is a boutique lodge uniquely positioned on the edge of the Nairobi National Park. The concept for The Emakoko was developed by Anthony & Emma Childs, who will be your hosts during your stay. They live on site with their small family and their dedicated team of friendly and accommodating staff. The Emakoko is deeply committed to the local community and the preservation and protection of the Park itself, with its huge variety of flora and fauna. The property features ten spacious and comfortable rooms/cottages, which each have a veranda that overlooks the picturesque Park. Five rooms are situated at the main level and five others are built into the cliff face higher up. Although the upper rooms are more work t climb up to, the spectacular views are beyond worth the effort! The rooms are designed for comfort, with luxurious beds and blackout curtains. The Lewa Wilderness Lodge offers a truly unique and personalized Kenya Safari experience. The property is equipped with nine exclusive rooms. Six thatched cottages are tucked into the hillside overlooking Lewa’s Eastern Marania Valley, and three more thatched garden cottages are nestled within the beautiful green lawns. No matter where you are, you will be surrounded by the pristine beauty, secluded silence and natural atmosphere of the region. Each cottage is tastefully decorated with antique and handmade furniture, giving each guest room its own rustic charm and the character of a ranch homestead. You are invited to escape from the hustle and bustle of city life and truly indulge in the finest version of the wild. Constructed entirely out of local materials, the award-winning Il Ngwesi Lodge is perched on the edge of the Mararoi hills close to the Ngare Ndare river in Laikipia District in Kenya, with breathtaking views towards Samburu as far as the eye can see. Designed by Simon du Fresne, six spacious rooms accommodate two to four people. Each one offers a slightly different experience, being either tucked away with views up the valley, adjoined to another by rope bridge for families, or overlooking the waterhole. All are designed in an ‘open to the bush’ style with opportunities for viewing wildlife, and two have extended verandas for visitors who wish to sleep under the stars in large four poster star beds. The main house (Il Laikipiak Hall) at the front of the site offers spectacular views to the north and east as well as down to the waterhole while the swimming pool area overlooks the valley and provides an excellent spot to relax in during the day. The waterhole, fed by pipes from a nearby spring, attracts a wide variety of birds and animals daily and is the lifeblood for wildlife in this semi-arid part of Kenya. Offering panoramic views over the Samangua Valley, the Lewa Plains, Mount Kenya and beyond, Borana Lodge is a photographers paradise. The property has eight romantic cottages, each with an open fireplace and private veranda. The cottages are entirely secluded and have private views from both bedroom and bathroom of the scenic valley below. The Lodge was designed to work in harmony with the landscape and is created entirely from local, sustainable building materials. All areas of the property overlook a lake that is a popular watering hole for the local wildlife, so there will be constant activity to keep you entertained. Take a guide and walk down to the dam to enjoy a close-up view of elephants swimming! Saruni Mara is the only small, boutique lodge in the Mara, with five elegant cottages, one family villa, and one private villa. The lodge is nestled in a secluded valley in the heart of the most exciting wilderness in Africa: Mara North Conservancy – an exclusive, private wildlife concession bordering the world-renowned Masai Mara National Reserve. Maasai warriors guide you throughout, sharing their ancient wisdom of the area and animals and their fascinating way of life.